I would like everyone to get involved in this great opportunity! Bloggers without Borders and Share Our Strength, no kid hungry campaign is going national people! 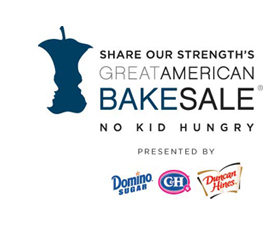 Across the nation fellow bloggers, and myself are signing up to host a bake sale in our communities to raise funds to help this wonderful organization. This is The Great American Bake Sale. As a student at the International Culinary Institute at The Art Institute of Portland and a food blogger I could not think of a better way to get involved in my community and give to those who need us the most, the children here in the U.S. Giving back is the simple part, but we cannot do it without the support of our friends, family, neighbors, and community. I have asked Whole Foods in the Pearl District of Portland, Oregon to generously donate supplies for my fellow students to bake goodies for the bake sale. I have asked local bloggers to get involved, and treat makers as well. Tana’s Treats organic doggie treats has donated items for our doggy friends at the bake sale. You can buy her treats online at her Etsy store, or go to the bake sale and find her treats there. The Art Institute of Portland has donated the use of their kitchen, cash to buy supplies for us to bake, signs, funds, tables, a location on campus, and have supported me through this from the beginning. Ben and Jerry’s Pearl District has kindly donated an ice cream cake gift certificate that serves 10 people! I will be raffling this certificate off at the bake sale. Costco of Vancouver donated supplies for baking as well! I am humbled, and grateful for all of the help and support. Our friends, John and Amy, were the first to make a cash donation to the site directly. I am so happy to have such great people in our lives! Thank you, Amy and John. I am surrounded by people who want to help. You can help too, even if you do not live in the Portland, Oregon or Vancouver, Washington area. You can go to my bake sale donation website directly linked to Share Our Strength to make a donation, any bit counts. Click on this link to be redirected to my donation site, Not Just Bake Donations. I am grateful to be in a position that I am to put something like this together to help the children of our communities. They need us, and I am happy to help. If you have any questions, would like to donate product, your time, or would like to know more about this please do not hesitate to contact me at fabiola@notjustbaked.com, or leave a comment below. I am here to help. Thank you for you support! For more information visit any of these sites, they are greatly informative. For even more information be sure to watch Hunger Hits Home on The Food Network Saturday April 14. Look for local listings for times, and make sure to set your DVR!